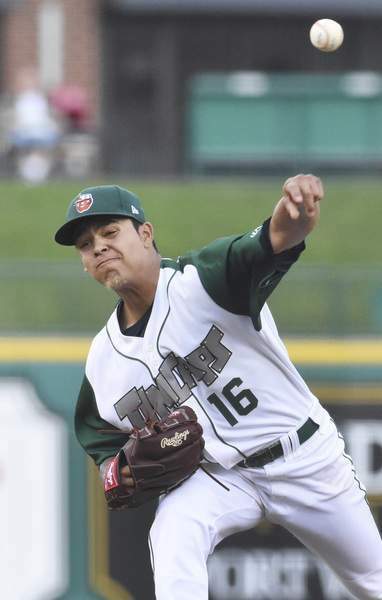 Rachel Von | The Journal Gazette The TinCaps placed Osvaldo Hernandez on the disabled list with left shoulder inflammation. In his place, the Padres promoted 2018 No. 7 overall pick Ryan Weathers to Fort Wayne. Weathers will start for the TinCaps against Great Lakes tonight. Hernandez leads the Midwest League in ERA (1.81) and wins (11) and has given up one earned run or fewer in 14 of his last 17 starts. The TinCaps had a significant shakeup in their starting pitching rotation Tuesday. The Midwest League's Left-Handed Pitcher of the Year, Osvaldo Hernandez, will go on the disabled list with left shoulder inflammation. In his place, the Padres promoted 2018 No. 7 overall pick Ryan Weathers to Fort Wayne. Weathers will start for the TinCaps against Great Lakes tonight. Hernandez leads the Midwest League in ERA (1.81) and wins (11) and has given up one earned run or fewer in 14 of his last 17 starts. He's coming off a start in which he wasn't his usual dominant self, but still pitched five innings and gave up one run while striking out four in a Fort Wayne victory. Manager Anthony Contreras tells me Hernandez's injury is "not serious", but couldn't elaborate further. Needless to say, if Hernandez misses his final two starts before the season ends, it will deal a significant blow to the TinCaps' playoff chances. Weathers, who made his first three professional starts in rookie ball with the Arizona League Padres, will be thrust into action in the first game of a hugely important three-game series against Great Lakes. The Loons enter the series one game behind the TinCaps in the second-half Eastern Division standings and these three games will be the final three meetings between the teams this season. Weathers has struggled in limited duty in his pro career, posting a 4.91 ERA in three starts. Those three starts have covered just 7 1/3 innings, however, so it's difficult to draw any conclusions from that small sample size. The Padres gave him a $5.23 million signing bonus to lure him away from a scholarship at Vanderbilt after the 18-year-old left-hander gave up one earned run (not a typo) in 76 innings pitched as a senior in high school. Weathers becomes the second 18-year-old on the Fort Wayne pitching staff (in addition to Luis Patiño) and is the No. 9 prospect in San Diego's farm system, per MLB.com. Weathers and MacKenzie Gore are the two most recent winners of the Gatorade National High School Player of the Year in baseball.